The MacBook Pro can drive the projector either as a mirror of the Mac display or in extended desktop mode, where either screen can be the main display with the menu bar, and the other becomes an extension of its desktop. If you connect another display (e.g. the projector) to the monitor output port, then the display preferences or the Display item in the menu bar (if available) can be told to Detect Displays. The Mac usually does this automatically. 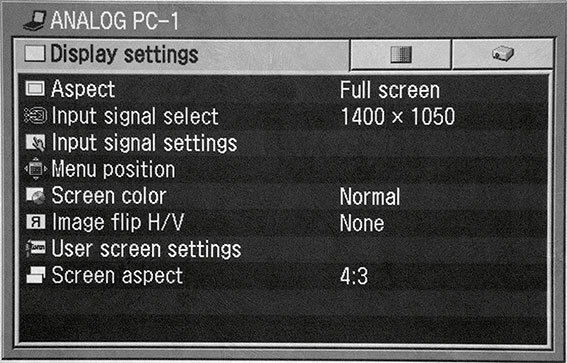 Displays Preferences shows the resolutions available on both devices, and the current settings. The following notes assume that you wish to project at SXGA+ on the Canon SX60. Plug the Canon SX60 to the mains, remove the lens cap, and press the red power button on the top. Connect the monitor cable to the DVI socket on the SX60. Connect a DVI to VGA adaptor to the other end of the cable and plug it into the MacBook Pro DVI output socket. Use the zoom control on the SX60 or the remote to fit the image to the screen, and adjust the height with the drop down foot, if necessary. In System preferences>Displays check Detect Displays. Perhaps click Gather Windows to bring both panels to the MacBook screen. Move them to see the panels side by side. Set the SX60 image size to 1400 x 1050. Now use the Canon remote to get Menu, which has three tabbed panes: Display Settings; Image Adjustment; and System Settings. The left and right arrow buttons move you between them on the row of tabs. Above: The Display Settings menu. 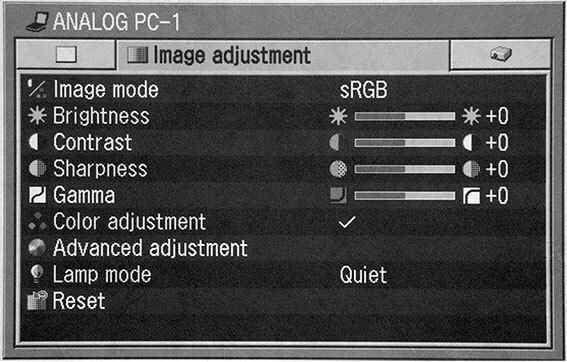 Above: The Image Adjustment menu. Ensure that you have sRGB selected as the image Mode item. 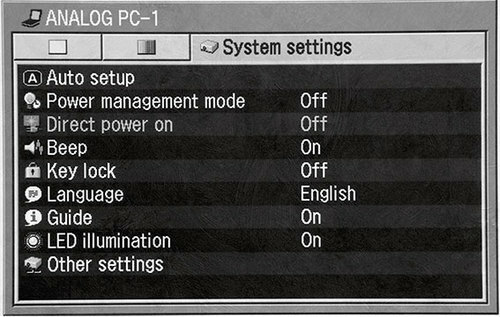 Above: The Systems Setting menu. With these settings you are ready to go.